After a cold breakfast of pop-tarts, bagels, granola bars and bacon on the patio, we shoved off for our days activities about 10:30. Scott & Erin had some other business to tend to, so it was just the Old Geysers (PK and KK) and our family today. 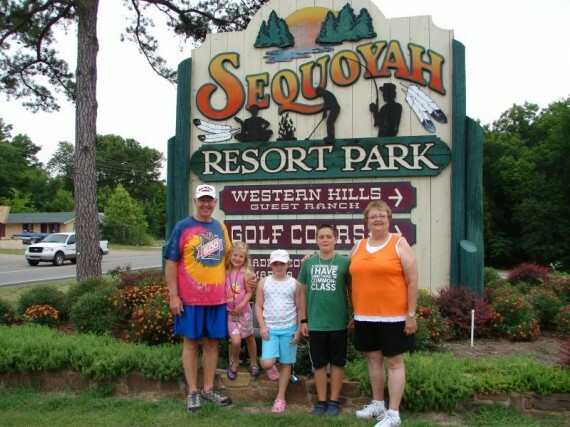 KK and PK with the grandkids at the Sequoyah State Park entrance. Our first stop of the day was the Nature Center, located just down the road from our lodge. This was a fairly new center, and it looked neat and well organized. There was a fish tank with turtles and fish of all sizes. We also saw a variety of snakes, as well as a tarantula. There was an enormous table set up in one of the rooms that was covered in bones, antlers, and shells of various animals. This was very much a hands-on exhibit. 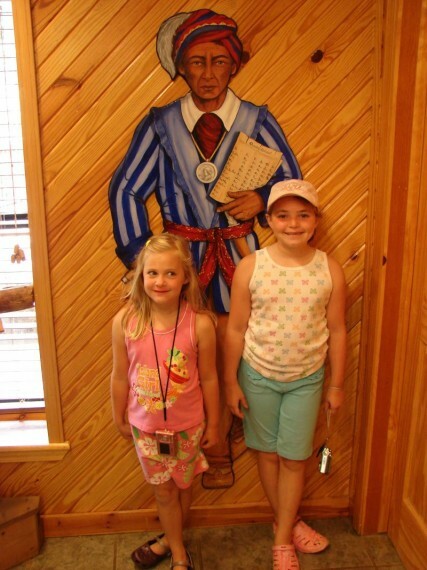 Marissa and Mallory pose with a picture of Sequoyah. Outside the nature center, there was a small collection of larger animals. The highlight of the collection was the Bald Eagle! It is always amazing to see one in person – they are so large! 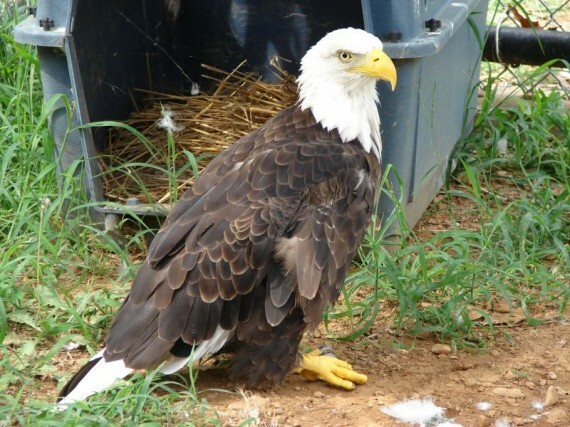 This eagle had damaged one of its wings and could not fly any more, so it is living out its life in the Nature Center. We also saw several owls (also very large) and a fox. 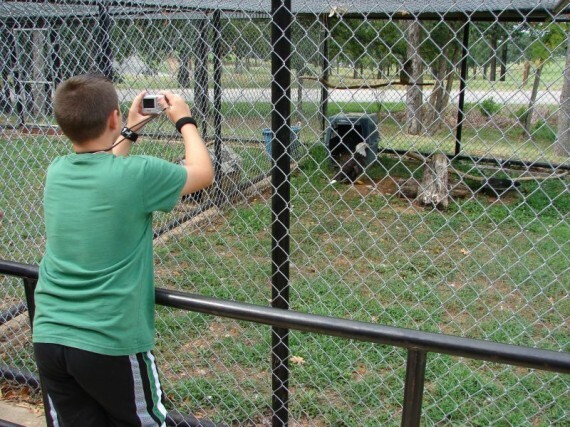 Miles takes a picture of the Bald Eagle at the Nature Center. The Bald Eagle is the most majestic bird I have ever seen. Our next stop of the day was the Cherokee Heritage Center and Museum. This museum is technically in Park Hill, but for all practical purposes it was in Tahlequah. It sits off the main highway just a few miles. We have lived in Oklahoma our entire lives and not been to this museum before, or to be honest, even knew it existed. We have been missing out. Everyone in our group thought that the entire experience was top notch. 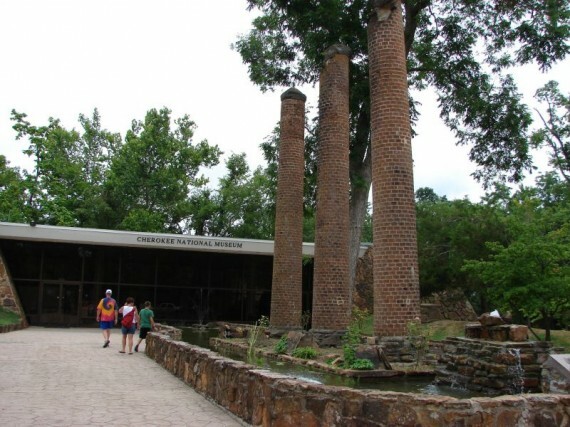 The Cherokee Heritage Center and Museum. The 3 columns are all that remain from the original Female Seminary Building. The center comprises of a first-class museum, which primarily focuses on how the U.S. Government mistreated the Native Americans and pushed them out of their homelands. The tribes signed treaty after treaty with the government, giving up more land each time, until finally President Andrew Jackson made the decision to relocate all of them to the Indian Territory and sell their land to the white man. The journey of the tribes from the southeastern United States to the Indian Territory is known as the “Trail of Tears”, as each tribe lost a substantial number of their members on this journey through harsh winters and awful conditions. The military would show up at the door of the Indians, perhaps right in the middle of dinner, and they would need to immediately get up and leave. They could take what was on their person at that time. They could not wait for other family members to come home, or to grab family mementos or valuables. 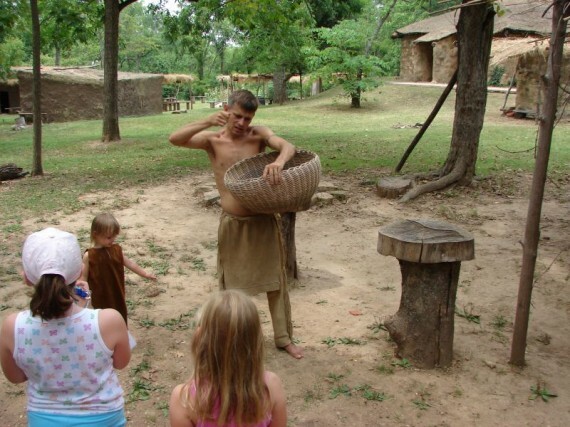 The center also had an interactive activity, which was a tour of an Ancient Village that was representative of the Cherokee before contact with the Europeans. The tour lasted about an hour, and was led by a Cherokee and his two young daughters. The tour explained how the double walled baskets the Cherokee made were stronger and more durable than those made by other tribes. The construction of blow darts and bows & arrows were also explained and demonstrated. Our Tour Guide explains how the Cherokee double walled basket is made. The tour guide told us that one of the common questions he receives is “where are the teepees” but he explained that the Cherokee were not nomadic people. They were agricultural based society, so they had permanent dwelling structures. Lastly, we learned that the Constitution of our own United States was based on a constitution written by the Iroquois tribe. I had certainly never heard that before, but several of the tribes were using a democratic form of government at a time when Europe only knew monarchies. Sequoyah, the Cherokee who wrote the Cherokee alphabet & syllabary, was prominently honored at the museum. The interesting thing about the Cherokee alphabet was that a Cherokee could become fluent in reading & writing the alphabet in just a matter of days. The Cherokee valued education and set up free schools for their children. After relocating to the Indian Territory, it was not long before the literacy rate of the Cherokee was higher than the general population of Texas and other neighboring states. After several hours at the museum, we took off for lunch at an old favorite of ours, Del Rancho. This place is known for their steak sandwiches, and Steph and I had been there many times with her Dad & step-mom. The kids loved the fact that you ordered your food by picking up a telephone and talking to the kitchen. 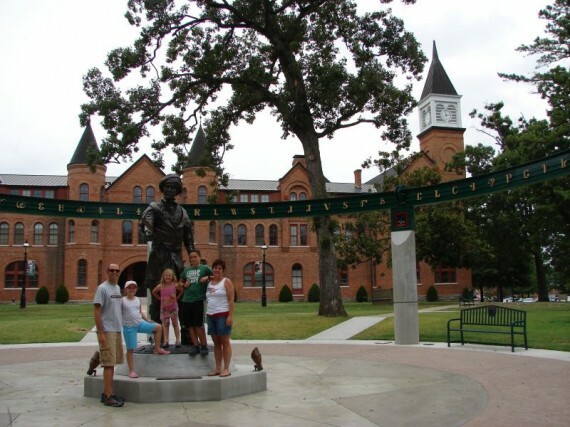 After lunch, we visited the Northeastern State University campus in Tahlequah, and specifically, the Seminary Hall. This is the oldest building on campus, and is the former Cherokee Female Seminary. The Cherokee had built very large seminary buildings for both the males and females in the mid-1800s. The signature building on the Northeastern State campus - Seminary Hall. Our next step was the downtown square, where we saw the Cherokee Supreme Court Building. This was built in 1844, and is the oldest government building in the state of Oklahoma. It is currently undergoing renovations, but the exterior of the building was in superb shape. One fascinating part of visiting Tahlequah is that the street signs are written in English and in Cherokee. There seems to have been a push in the last 40 years to embrace the Cherokee heritage and language. As Stephanie pointed out, this is about the time that the U.S. Government started recognizing the tribes again in a more formal way. 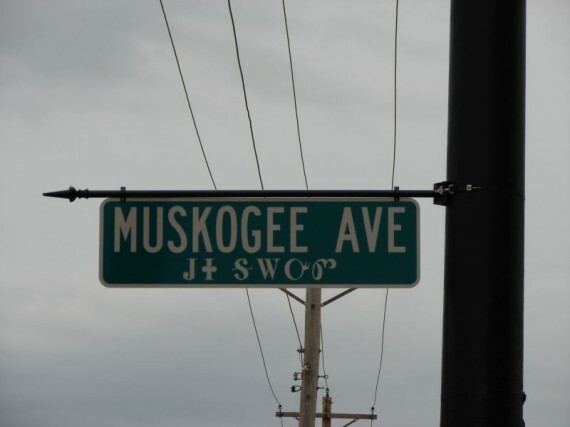 Many of the street signs in Tahlequah are written in English and Cherokee. Scott met up with us in Tahlequah, and we drove out to the Illinois River. The Illinois River is very scenic, and is a large source of tourism for the area. We found a public access point, and splashed around in the river for a few hours. The water was a bit cold at first, but our bodies got used to it quickly. We ate a dinner of cold bratwurst and chips on the shoreline. Before dinner, all of us were in the river visiting, and by this time the overcast skies had started to sprinkle. Miles unintentionally splashed some water on PK, and she said to him, “Stop splashing me! I don’t want to get wet!”. The rest of us were looking at her and I said, “Mom, then why are you sitting in a river? In the rain?” After she made her statement, she was hoping that nobody noticed the irony of what she said! 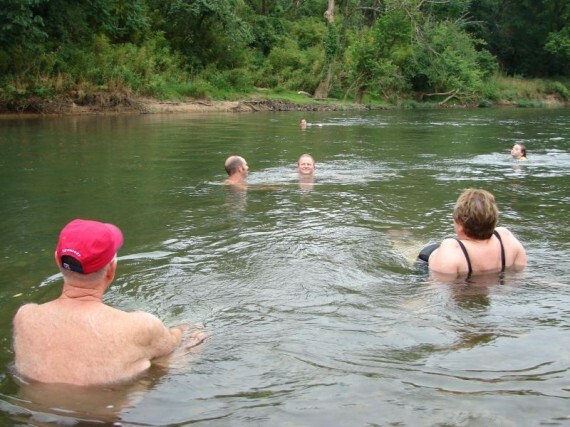 We splashed around in the Illinois River in the early evening. The current was swift! Stephanie and the kids examine some fish in the river. We made it back to Western Hills around dark, and Miles & Mallory played another game of Phase 10 in PK & KK’s room. The kids have been coming back to our room about 11:30 or 12 each night. Mallory has become quite interested in the Cherokee alphabet. She has picked up herself a short book on the subject, and is continually telling us how to pronounce an item in Cherokee. We have been greeting each other with the Cherokee word for “Hello” – “O si a” (pronounced “O” – “C” – “AH”). While lying down in our beds for the night, we paid particular attention to a picture that had been hanging on the wall of our hotel room the entire time. It is a picture of a Navajo pot, Navajo blanket and Saguaro cactus! Apparently whoever had decorated the rooms at the Western Hills Guest Ranch thought any old Indian picture would do. After our day of culture, we certainly think that the Cherokee have enough history and heritage to deserve their own pictures on the wall of the local hotel.